Note to self: scrumptious (the meal). The flounder. It’s a noble fish – but it’s also a great story. They come together in this blogpost basically only because last night’s meal was far more successful than the image I took of it*. My camera decided to act up, and gave me something with such a fulvous hue I couldn’t even make it right with my (basic) Photoshop skills. 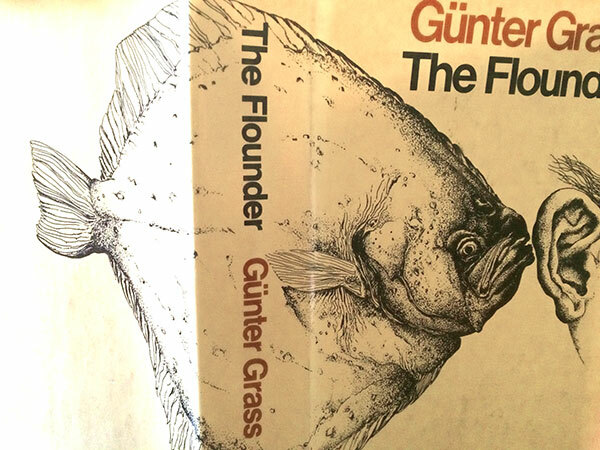 This morning therefore I thought of another wonderful flounder which I could use as a stand-in, Günter Grass’ beautiful etching of a Baltic flatfish that appear on the cover of the creature’s eponymous novel. I bought the copy inside the dust jacket in this picture some 35 years ago, as soon as I could get my hands on the English translation. ‘The Flounder’ is, among other things, about history, bodily obsessions, gender politics, copulation, and food, and an ocean of humor runs through it. I thought an image of the cover would be a perfect placement here. Yesterday was one of our anniversaries, and I was hoping the meal I cooked would be worthy. I sent a text to Barry from the Union Square Greenmarket, showing him the choice of seafood available that day, and he picked the flounder. He already had a super Rhineland Pinot Blanc picked out, and that evening I came up with what I thought would be recipes for the fish and vegetable accompaniment that would make a sympathetic pairing with the wine. The results were, well, . . . very good. 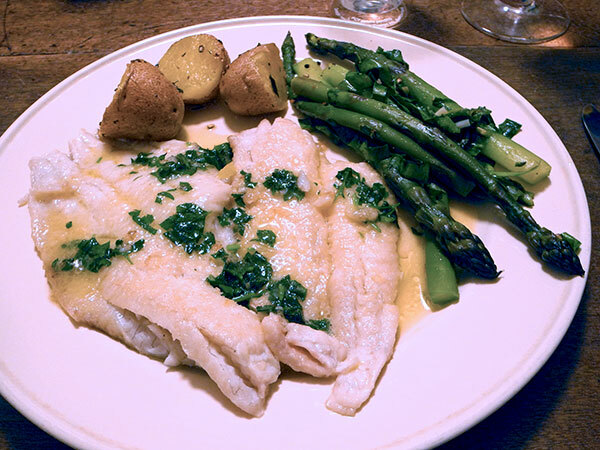 The fish was superb, subtle, sweet, and succulent, and my almost serendipitous combining of ramps and asparagus (I had been surprised to find the latter in the market so early in the season, so I had to bring some home) offered a gentle, woody foil for it. A few small boiled potatoes also showed up, for texture and for a mild savory contrast (also for tradition). I was surprised that the fillets were, for the first time in my experience, very easy to turn over, and eventually remove from the pan each in one piece. There was also virtually no browning, and yet the fish was perfectly done, and even sweeter, juicier than I ever remember experiencing with flounder. I may have used a bit more oil (and butter) than I usually do, and I know that I didn’t have the heat up very high when I first placed the fillets in the pan. Either or both of those conditions might explain that success. Oh, there was also the incredibly wonderful – and surprisingly distinctive – flavor of our local lemon, which was responsible for much of the flavor of the sauce. We began with champagne, and the evening got even better as it advanced. This is another of my favorite placeholders, in the sense that a package of very good filled pasta kept frozen in the refrigerator can substitute for a more ambitious meal when time is short. Tonight my excuse was our presence at Momenta Art’s 2015 Spring Benefit. 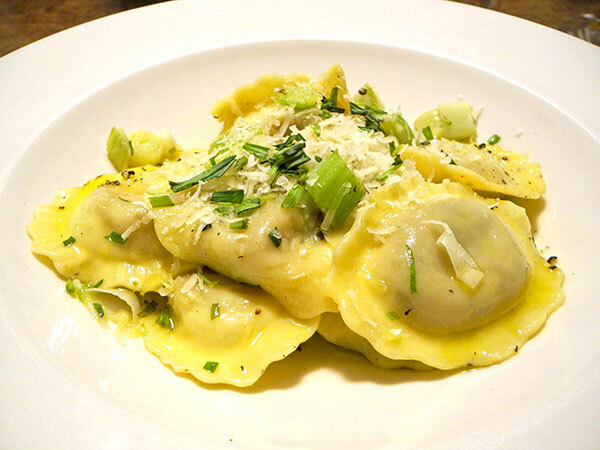 A dinner assembled around a prepared fresh pasta is like a night off from the kitchen, and it may seem almost a trifle, but it can be delicious nevertheless. The sauces I add to the pasta are usually pretty much improvised each time, from among the ingredients I may have on hand, and that was certainly the case here, although they happened to include some of my favorite flavors, celery, tarragon, and any form of spring allium, not to mention a good aged Parmesan. This room temperature main course salad is one of our safe dishes, meaning that it’s one of the ways we still get to eat healthily at home, even if we return to the apartment very late (last night it was the Henry Kaiser/Weasel Walter Large Ensemble at JACK). It’s another one of Mark Bittman’s 111 Quick Meals , entrées which can be prepared – optimistically – in ten minutes or less. Two months ago I wrote about what I could describe as our most popular winter choice from among the list. In fact however, either meal is suitable for any season, and each is as delicious as it is quick and easy. The better the beans, and the oil-packed tuna, the better the salad; I’ve used many different brands of beans, but this time I used Whole Foods’ ‘365’. The tuna was from Tonnino tuna (I don’t remember where I had picked up the jar). I also used onions from John D. Madura Farm, and rosemary from Phillips Farm. The New York Times kitchen wizard would almost certainly approve of any sensitive alteration, even if it might add a minute or two to the timetable. That could mean including some salad greens placed under or tossed with the bean-tuna mixture, and I’ve occasionally added dried red pepper flakes, or halved ripe cherry tomatoes. This time I passed on greens, chiles, or tomatoes, and I saved us a couple of minutes. 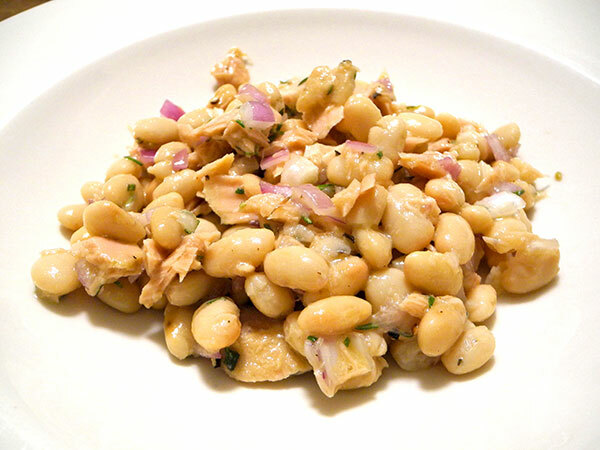 this is Bittman’s recipe, number 8 from his addendum to his original list of 101, exactly as he published it in 2007: 8 Bean-and-tuna salad: Good, olive-oil packed tuna is a must here: Combine two cups of cannellini beans, drained, with a minced red onion, a can of tuna, olive oil and salt and pepper as needed. Chopped sage is great in this, as are rosemary and basil. Note to self: The dinner and wine were both delicious, but the music was extraordinary, plus a huge surprise, since I had thought, as a huge fan of Hans Werner Henze for well over half a century, I was familiar with virtually all the recorded heterogeneous work of this awesome leftist, queer musical and theatrical genius. The fisher folk were not at the Union Square Greenmarket on Monday (possibly because of the storm). 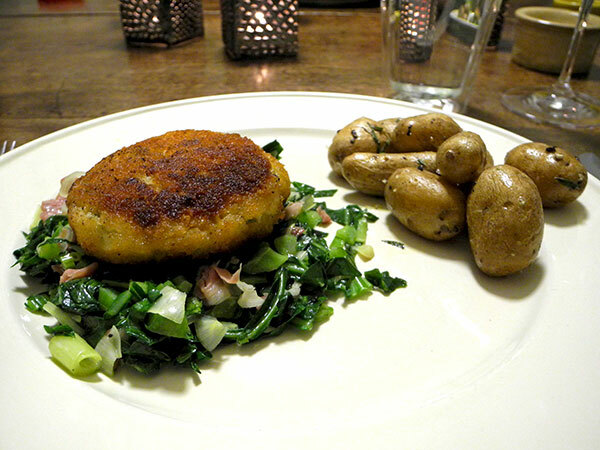 I had been looking forward to a seafood meal, so I was fortunate to have some frozen crab cakes which I keep on hand for such emergencies. The introduction of some cured pork (prosciutto in this case) to the greens, making the meal a queer ‘surf ‘n’ turf’, added an additional sturdiness on a stormy night. two crab cakes from P.E. & D.D. Seafood, (ingredients: crab, egg, flour, red & green peppers, garlic, salt, pepper, breadcrumbs, mayonnaise, milk, celery, parsley), heated in a heavy iron pan, four minutes to each side, then placed on a bed of greens (collard and some kale), chopped Applegate Naturals prosciutto from Whole Foods, sliced spring garlic from Norwich Meadows Farm, some juice of a lemon from Fantastic Gardens of Long Island, in a procedure mostly following the vegetable portion of Emma Ribiero’s recipe. This is the second time I’ve prepared sea perch, and I’m already growing very fond of it. Although supposedly not related to the freshwater fish of the same name, it tastes remarkably similar to the species I grew up with on the Great Lakes, and that’s a very good thing. Also, in Michigan and Wisconsin our perch were never red. 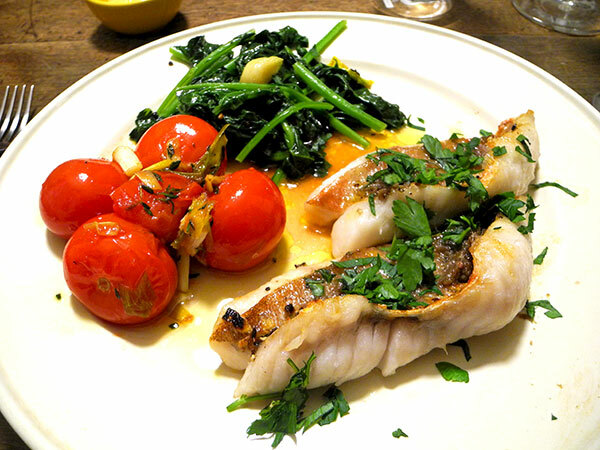 I used a different recipe for the fish this time; it’s ‘Perch with Anchovy Sauce’, like the last one, is from Mark Bittman’s ‘Fish: The Complete Guide to Buying and Cooking‘. I can’t say which I prefer, since I’m very fond of both herbs and anchovies. Right, the anchovies! Certainly a good reason to distinguish sea perch from freshwater perch: I mean, would I use anchovy with lake perch?